Series : Book 2 of "More"
"For every action there is an equal or opposite reaction.­"
It was my choice to walk away the first time. And my choice to chase her the second. and all you get are the consequences. Unless that someone is Logan Matthews. the strength to walk away. the courage to fight for him. all it gave me was a broken heart. Series : Book 3 of "More"
where monsters hide and aim to ruin. They ruined us and turned our dreams into nightmares. Not just for us, or for each other, but for our light. LUCY- There is a love so fierce it cannot be measured. A heart so strong it will never slow. There is a promise so sure it can never lie. He promised me that love forever. Even when it wasn't enough. -­CAMERON- Forever. Everlasting. Eternal. There is no measure of time. No sounds of the ticking of a clock. Just the rising and falling of the sun. And our own sense of forever. But our forever isn't always. For every choice you make there are rewards, or there are consequences.­It was my choice to walk away the first time.­And my choice to chase her the second.­But sometimes you don't get a choice, and all you get are the consequences. Unless that someone is Logan Matthews. Because loving him didn't give me the strength to walk away.­It didn't give me the courage to fight for him.­And when it was over, all it gave me was a broken heart. 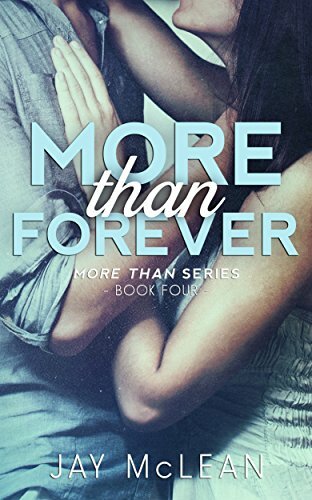 More Than Forever is book four in the More Than series and should not be read prior to reading the previous books in the series. But our forever isn't always. More Than Forever (Book four) -- There’s no emotion greater than fear. While time and everything around us stands unmoving… who’s to say we can’t have it all? We wanted it all. And ignored the . . .